CyanogenMod 14.0 (CM14) Android Nougat 7.0 Custom Rom is now available for the Xiaomi Redmi Note 3 Snapdragon version users. Android 7.0 Nougat is the latest Android version, and now the Note 3 users can enjoy the same on their phone. This is an initial WIP CyanogenMod 14 build based on nougat. The ROM has some bugs, we tested the same on our Note 3, and most of the features are working fine, but there are some bugs like video recording not working sometimes, and rest of that everything is working fine on the CM 14 Android 7.0 custom ROM. Here in this post, we’ll discuss how to flash the latest Android 7.0 CM 14 ROM on the Redmi Note 3. To flash the ROM all, you need a phone with Custom TWRP recovery. To flash the TWRP, you need a phone with unlock bootloader. All guide are mentioned in the step by step guide of the flashing the ROM. All credit goes to the XDA developer Santhosh M, who released this new CyanogenMod 14 Android Nougat 7.0 for Redmi Note 3. Before following the below mention tutorial do take the full backup of your phone and save the files on some place like PC or your external memory card. Warning: Technobuzz.net is not responsible for any damage that might happen to your phone during this process. You’ll lose all your data upon unlocking bootloader. Follow all the steps very carefully and read all the instruction before starting the flashing of CM 14 on Redmi Note 3. As we mention above this guide is only for the Redmi Note 3 Snapdragon version users and don’t try this method on any other Note 3 variants. To flash the ROM you have to unlock the bootloader of your phone and Install the TWRP recovery. Read our guide here “How to Install Official TWRP on Redmi Note 3” If you already Done that follow the below mention guide. Below is the Link from which you can download the CyanogenMod 14 for Redmi nOte 3 Save the Zip file on your phone, and you have to flash the same on your phone with the help of TWRP recovery. To install the latest Google app on the CM 14 ROM, you have to flash the latest Google apps zip file on your phone, Download the zip file save the file on your phone. Make your you download ARM 64 version Gapps Zip file. 1. First download both the zip file (CM 14 and Gapps Zip file) and saved on your phone. Remember the location of the file. 2. Boot your Redmi Note 3 TWRP recovery mode. To do this, Switch off your phone first and wait for 5 seconds. Now Press Volume UP + Power Button to boot into TWRP Recovery Mode. 3. [OPTIONAL] Take the Nandroid backup of your system, If something goes wrong during the flash process, you can quickly restore the previous system on your phone. To do this Tap on Backup and take the backup of your system. 4. Go back to the home screen of TWRP. Select Wipe > and Swipe to Factory Reset. 5. Now again go back on the home screen of TWRP and Select Install and locate the CM 14 ROM zip file that you saved to your phone in step 1 and Flash the same on your phone. 6. After that flash, the Gapps Zip file on your phone. 7. Once both the zip files are successfully installed on your phone. Reboot System. Now you Redmi Note 3 will boot, and the first boot will take 5 to 10 minute to boot. So be patient and wait for some minute. Now you can see the CM 14 Home screen on your phone, and you can enjoy the CyanogenMod 14 Android Nougat 7.0 on your phone. 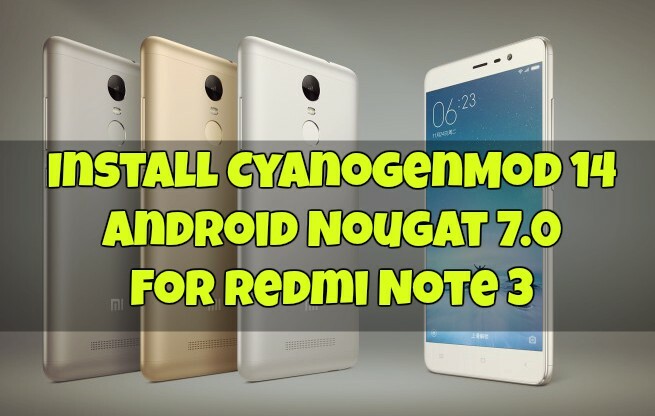 Below is the Video Guide to the Install CyanogenMod 14 Android Nougat 7.0 on Redmi Note 3. Hope you like the guide to install CM 14. Follow and like us on social media. For queries comment down below. A my bootloader is Unlock and i loas my data and System so no os in my redmi note 3..
so what i do for cm14 or cm13 for my redmi note 3.. This is contect no 9512217289…. I have updated redminote3 to 8.1.1 Android version 6.0.1 recently. Please mention whether we will get OTA again to update to nougat 7.0 for redminote 3? Is it latest version! Can you reply. Please clarify whether Redminote3 will receive OTA to update to nougat version from MIUI 8.1.0 Android version 6.0.1? If so probable month and year. Now redminote3 is running on 8.1.0.